Over the years, we have been fortunate to have some very good shooting guards, who could not only shoot the outside shot well, but also attack off the dribble. Below are several plays that are designed to get O2 (your shooting guard) open for good shots. Some have already been posted on this web-site and are linked here. Others are new and are shown below. We run these mostly out of our 3-out, 2-in motion offense, but you could run them out of any offense by just calling a play and getting your players positioned correctly. You could also run any of these plays on the opposite side of the court for O3. Versus man-to-man defenses, first, two basics that we have used a lot are "WS-2" and its "Back Option", and the "Kentucky" plays. Kentucky-2 is an excellent play if O2 is a good 3-point shooter. So, look at these first. Here are several good plays that start in the Box-set: "Circle", "Flare", "Pistons", "Euro", "SpartanBD (back-door)", and "DHO (dribble hand-off)". The "Redhawk" plays get O2 open either off a curl-cut in the paint, or for an open 3-point shot in the left corner. "Wisconsin" gets O2 open for a 3-pointer from either the top, or the right wing. "92 and 93" are set-up for our wing players, either O2 or O3, and "94" gets O2 a 3-point shot. "America's play" gets O2 open for a 3-point shot on the top. "52-Curl" is run out of the 4-out motion offense ("Low" set). Here are several new man-to-man plays that will get O2 some good shots: Kansas, Jayhawk, Louisville, Arizona, Arizona and Back, 42 & 52, Illinois, Virginia, and Elevator. Versus zone defenses... in addition to running your usual zone offense, here are several plays for getting O2 open for shots. Against almost any zone including the 1-2-2, 1-3-1 or 2-3 zones, try the "Zone-2" offense. O2 will get open shots from the corner as your "runner", and there are several other options and plays that will get O2 shots. Versus the 2-3 zone, look at: "Iowa", "Indiana", "Corners-52", and "UConn". This is a good play if your O2 is tall, athletic, and can jump. O3 slides to the corner. O4 screens for O1. O1 dribbles over the screen to the wing and becomes a passer. O4 rolls off the screen down the left side of the lane for the pass from O1. If the initial pass is not there, O4 moves out to the short corner. Meanwhile, O2 moves up toward the top calling for the ball, and O5 comes up and back-screens for O2. 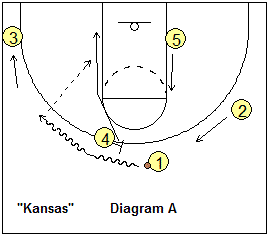 O2 maKansasA.GIFkes a hard back-cut to the hoop and O1 lob passes to O2 for the lay-up (diagram B). After screening, O5 pops out on top and could get the pass from O1 and take the 3-point shot (diagram C). If O2 does not get the pass off the cut, he/she moves out to the corner for a possible pass from O5, and the 3-point shot (or shot-fake and drive). Key points - O4 must stay on the left side of the lane (and go to the short corner), or else the middle will become too clogged for O2's cut. O5 and O2 must time the back-screen and not go too early, but wait probably until O1 goes over O4's screen. Jayhawk is the "sister" play of Kansas (above)... very similar. O1, O4 and O3 do exactly the same things - O4 screens for O1 and rolls down the left side of the lane, while O1 dribbles left over the screen and becomes a passer. O3 slides to the corner. In Jayhawk, O5 goes to the opposite elbow while O2 starts low on the block. Instead of a back-screen (as in Kansas), O5 down-screens for O2. O2 cuts around O5's screen for the pass from O1 and the 3-point shot. The only difference between the two plays is that in Kansas, we use a O5-on-O2 back-screen, and in Jayhawk we use a O5-on-O2 down-screen. This play gives O2 a chance to take the seam with a dribble-move from the top. We move both post players off to the left side, to clear the right side of the lane for O2. O4 flashes to the left elbow, while O5 posts up on the left low block area. O1 passes to O3. O2 back-screens for O1 and O1 moves out wide to the right corner. O2 pops out on top and gets the pass from O3. You'll notice that this now looks a lot like the "Loyola" play, except with O2 going into the right seam. O2 can shoot the lay-up or pull-up jumper, or pass to O5 or O1.